There is nothing in the world like a slow cooked pot roast, and we have to say, this may very well be the best we’ve tasted. 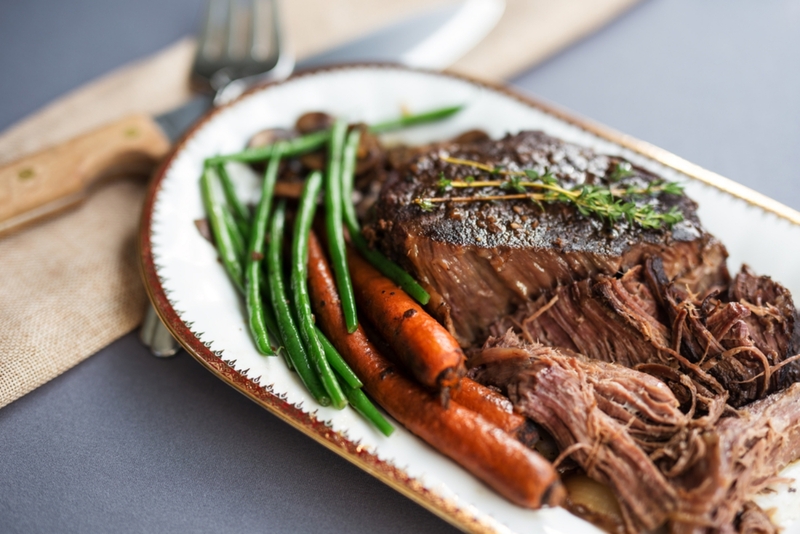 Maple and Dijon just might be the greatest thing to ever happen to a pot roast – and the crust on the outside, made by searing it first in delicious bacon fat, sends this baby right over the top. Thrown together in the morning and left to work its magic all day while you’re clacking away at work or out running errands, it’ll turn your house into a heavenly aromatic oasis. If you grew up eating this staple on a regular basis like we did, be forewarned – this is not your mother’s pot roast, although she may adopt it as her own if you’re nice enough to share! If using whole bacon, fry on medium heat until fat has rendered. (You’ll be using it to sear the roast!) When done, remove bacon strips. (Eat them or dice and add to a side dish!) If you have the fat already on hand, you can use that instead. Whisk together half of chicken stock (1 cup), Dijon, balsamic vinegar, maple syrup, smoked paprika, salt, and pepper in a medium bowl. Pour over roast in slow cooker. Discard all but enough bacon fat to coat pan, add onions and cook on medium heat until slightly soft, about 5 minutes. Add remaining chicken stock and bring to a boil. Scrape up any bits stuck to the pan and transfer to slow cooker. Cover and cook on low heat about 8 hours, until meat is tender and falls apart with a fork. Transfer roast to a serving platter and cover with foil. Pour liquid into a large saucepan. Bring to a boil and cook until reduced to desired consistency. Pour over the top, or set aside to pour over individual servings. Garnish with sprigs of fresh thyme and serve with whole roasted carrots, sauteed mushrooms and green beans!